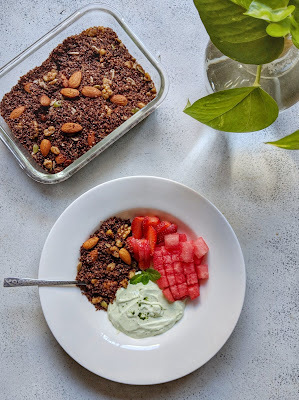 Homemade Ragi Granola, an inexpensive and totally guilt free indulgence for picky eaters. Lots of hidden sugars are in store bought expensive granolas which would not meet the nutritional requirements. Added unsweetened cocoa powder and cinnamon to it for extra flavor. Served this granola with matcha flavored greek yogurt, watermelon cubes, strawberries for breakfast. Heat oil in a pan, toss in ragi flakes with coconut until crunchy, remove it add the nuts and seeds toss until crunchy. Mix all in the same pan add raisins, cocoa, cinnamon powder, salt give a good mix in low heat, cool it and store it. This could be baked as well but takes longer time and need to be watchful with nuts and seeds, so pan works easier. Ragi flakes can be replaced with any millet flakes (resembles thin poha) easily available in stores selling Organic produces. Almonds, walnuts can be chopped and used in the recipe. A trendy looking bowl meal made healthy, colorful and filling. Not much of a recipe it is, just ingredients from the refrigerator used. 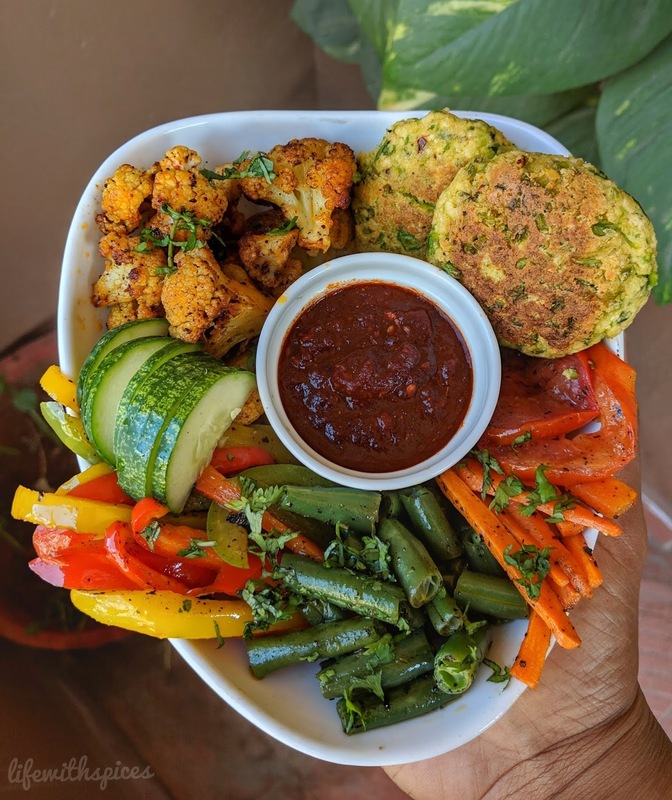 This bowl has falafel, roasted cauliflower, beans, carrots, bell peppers, cucumber, grilled tomato slices and roasted garlic chilli sauce. Marinate florets in the above ingredients and toss until it turns crunchy in a pan. Toss in a a pan one by one by sprinkling salt and pepper untl they turn crunchy. Pulse the par boiled green peas with coriander, green chilli and make it to a coarse paste. In a bowl add crumbled paneer, pulsed green peas mixture, spice powders mix well and shape it into small falafels. Heat oil in a pan and pan fry on both the sides until crunchy. This can be deep fried as well / baked. Soak chillies in hot water for an hour grind to smooth paste with finely chopped garlic, salt and cook in 1/4 cup olive oil in lowest heat until the raw smell leaves. Assembling the bowl and dig in.. 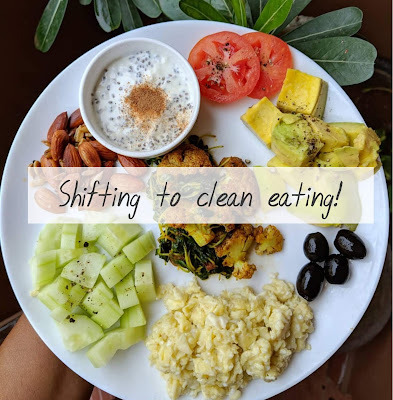 Shifting to clean eating should happen as a life style change and not as a task for short period. Carbohydrates are integral part of Indian diet / meals. All our three course meals contain good loads of carbs which we've been consuming all these years an theirs this sudden urge to cut down on these. Simply put sedentary lifestyle, incorrect eating habits, consuming high processed and sugar foods are all few key reasons which has made most of the individuals over weight / diabetic. A meal has to be a healthy mix of lesser carbs, moderate proteins and fats which we tend to miss out on. Here i have lined up few key steps to begin with with my very own experience. 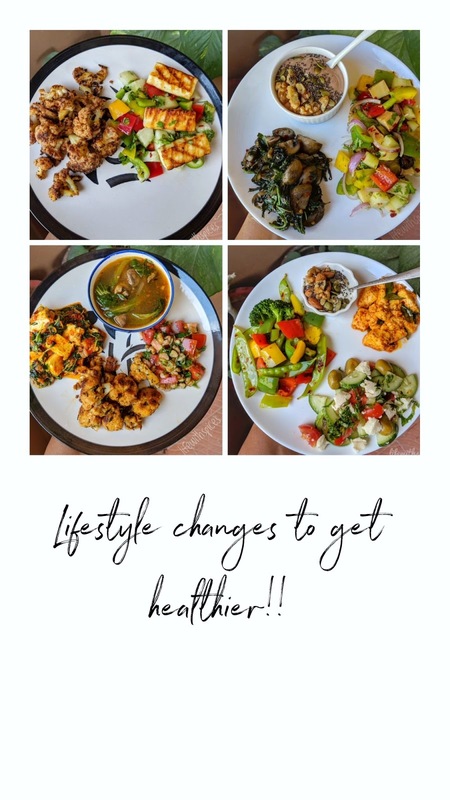 I am no Doctor / Certified professional giving diet charts / plans but am under the guidance of a Doctor and a nutritionist who has guided me thru a better life style change. 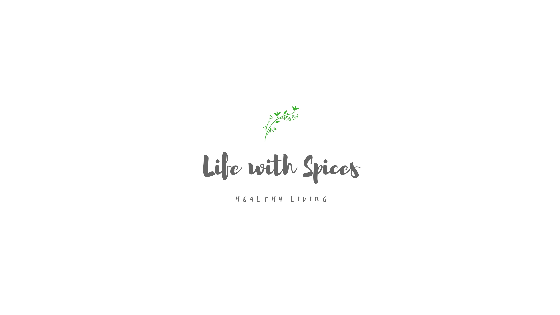 The whole approach begins with firstly cutting down on sugar in any form be it maple syrup, cane sugar, brown sugar, jaggery in any forms which also includes sugar free varieties. Next on waking up after drinking water, black coffee / black tea / green tea works the best, quitting on milk / creamer is the next big step. 60% of the milk consumed is adulterated in our country, so its better to keep them in lower quantity or avoiding them completely. Including fresh veggies especially salads and greens in every meal at least for lunch and dinner has to be made mandatory. No expensive veggies are needed for salads just a good piece of cucumber with half tomato and black salt will do. No Fast foods, all that begins here doesn't end well. High amounts of MSGs in flavorings, sauces, cheap oils, taste makers, excessive food colors are all strong roots for an unhealthy future. Packing snacks to Work / Study place works best it could be seasonal fruits / peanuts / channa / salads / nuts / dry fruits. Choosing good oils / fats for cooking, ghee, butter and coconut oil are the best to cook. Sesame oil, mustard oil and olive oil goes well as well in moderation. Avoiding all variations of white or brown breads / noodles / pizzas / bakery products. So running for expensive quinoa or oats instead of rice is a fad as well. Just sticking to normal and native rice varieties / millets just that portions have to be monitored and reduced. No bottled drinks be it sugar free, preservative free it's safer and pocket friendly to go for fresh juices. Swapping to Pink Himalayan Sea Salt is the need now which contains minerals, calcium, potassium and traces of many other stuffs which people intake as expensive supplements. Ignoring all these low fat yogurt / butter / protein bars / salad dressings / breakfast cereals etc these are marketers gimmicks to sell to weight watchers at a higher price. Extra preservatives are added to remove the fat in the process and for extra shelf life. Start counting on calories be it whatever diet one opts for. Calorie deficit meal is all needed if weight loss and fat loss should happen. Instead of 4 idlies cut it to 2 idlies and add a portion of protein / fat which is a game changer for sure. Completely avoiding on high fructose variety fruits is important specifically the imported ones. Our body is designed to handle fructose only in small amounts so choosing wisely local and seasonal fruits are the best-est option. Quitting on starchy vegetables to start with potatoes. corns, frozen peas. Its important to chose wisely on our food intake with the completely adulterated food Industry the key is to go local, eat local and buy local foods. No workouts will work if there is no proper diet charted out and followed consistently. With above said few changes to our life style a sea change in health wise would happen in few weeks. Lets get in shape with few changes and hope for a better tomorrow. Garlicky soup with Bok Choy makes a comforting soup in this weather. Homemade veg broth makes it a double flavorful one. I used cauliflower, broccoli stalks, coriander n mint stems, onion peels, few other veggie peels with couple of pods of garlic and a bay leaf to make a cup of veg stock. Some thin noodles / pasta to this would make it a complete meal. This is a no sauce soup who would prefer could add them. The ones i used were baby bok choys they were tender ones, so didn't bother to remove the thick stalks. But made sure to remove the leaves individually and clean them. In a large pan melt butter, saute garlic, onions until slightly roasted. Stir fry mushrooms and cook until it turns tender. Add in cleaned bok choy, veg stock and simmer for 5 - 6 minutes add in chilli flakes, salt and pepper as required and enjoy the soup. Chilli Butter Mushrooms, easy and super quick dish which makes a meal. Pysillium husk and almond meal can be replaced with corn flour / maida and for the crunch bread crumbs can be used. Heres a quick video of the same. Melt one tbsp butter in a pan, cook mushrooms until they browned and remove it. Add diced onions, capsicum, pepper, red chilli flakes, salt add mushrooms and sprinkle spring onion. 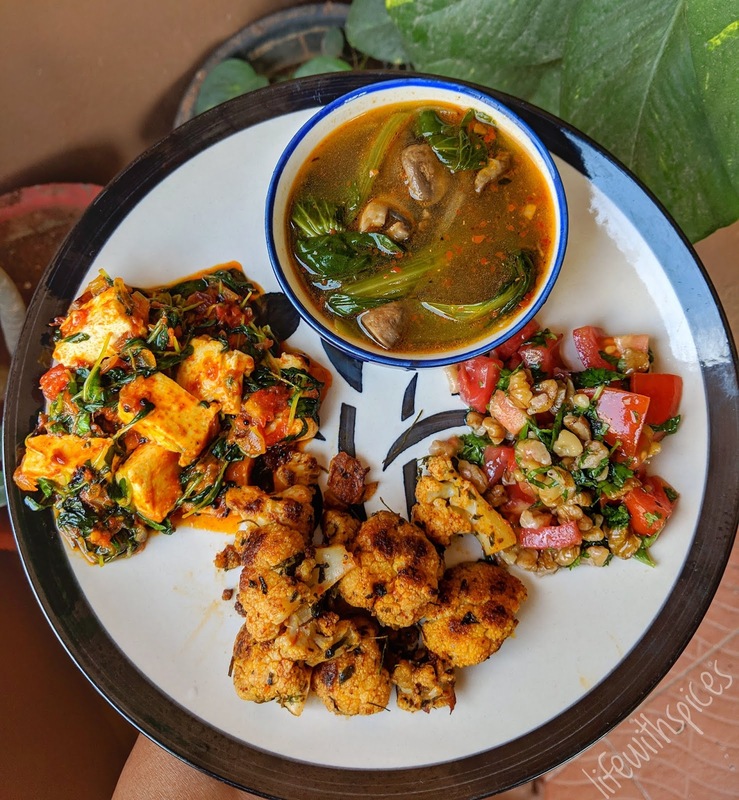 Achari Sabzi, simply means pickled veggies which could be interpreted as sabzi made with pickling spices. A bit lengthy list of ingredients but totally worth attempting it once in a while. Traditionally this is made with more tomatoes and yogurt for the extra gravy consistency and for the creaminess. I kept them bit low to suit my Low carb meal plan. Have shared the making video above. Melt 2 tbso ghee in a pan, splutter mustard seeds, cumin seeds, fennel seeds, onion / nigella seeds, fenugreek seeds, 2 red chillies and sauté on a medium flame for a few seconds. Saute onion, ginger garlic and saute well. Add the pureed tomatoes, mix well add spices and cook until ghee starts to seperate. Add brinjal cover and cook for 2 minutes, add boiled cauliflower, capsicum cover and cook in low heat for 4 minutes. Add yogurt / curd mix well and sprinkle fresh coriander. Serve it hot with rotis or parathas. A Kerala delicacy, recreated in a Vegetarians favorite Paneer. Here's the quick preparation method of the paneer pollichathu. 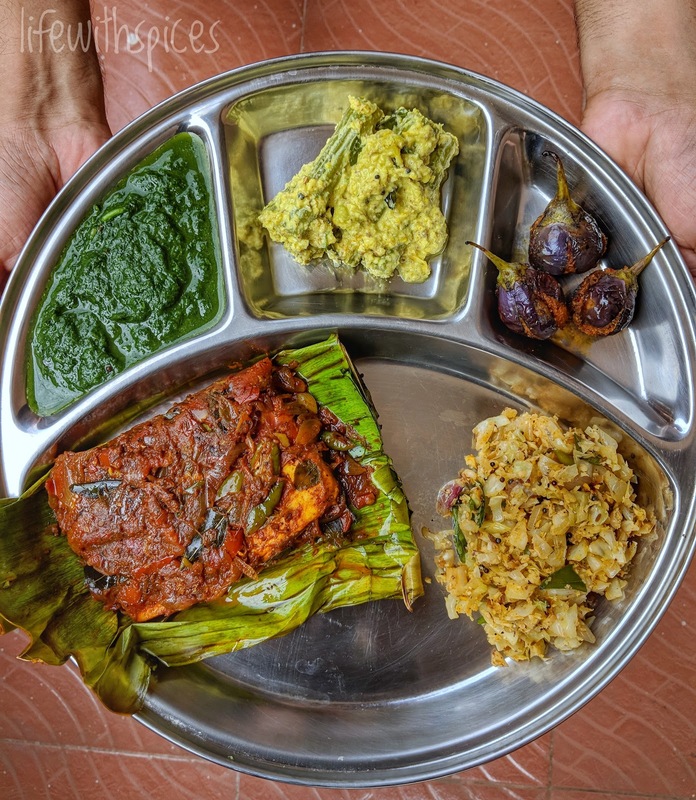 Well marinated Paneer rolled in to a spicy masala and cooked in banana leaf. Cut paneer into half, mix all of the above to thick paste and spread it on the paneer and allow to marinate for 30 minutes minimum. Heat 2 tbsp oil in a pan and fry the paneer quickly on each sides for about 30 secs on each side, remove the paneer. This step can be skipped it's totally our choice. Until the oil starts to separate. Toss the banana leaf on the open fire, place a big leaf first and then a smaller leaf, place some masala, paneer piece and cover it with some more masala. Fold it gently and wrap it like a parcel with a thread or like I used tooth picks. Heat a tsp oil in a pan and place the parcels, in lowest heat for 2 -3 minutes approximately cover it, turn it and allow to sit for another minute and remove from heat. Enjoy the spicy paneer pollichathu..